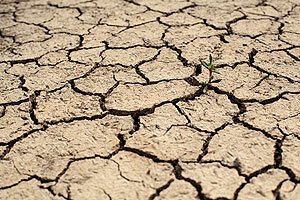 A drought is a period of drier than normal conditions that results in water-related problems. Drought occurs in virtually all climatic zones, but its characteristics vary significantly from one region to another. Drought is a temporary condition; it differs from aridity, which is restricted to low rainfall regions and is a permanent feature of climate. Meteorological droughts are defined in terms of the departure from a normal precipitation pattern and the duration of the event. These droughts are a slow-onset phenomenon that can take at least three months to develop and may last for several seasons or years. Agricultural droughts link the various characteristics of meteorological drought to agricultural impacts. The focus is on precipitation shortages and soil-water deficits. Agricultural drought is largely the result of a deficit of soil moisture. A plant's demand for water is dependent on prevailing weather conditions, biological characteristics of the specific plant, its stage of growth, and the physical and biological properties of the soil. Hydrological droughts refer to deficiencies in surface water and sub-surface water supplies. It is measured as stream flow, and as lake, reservoir, and ground water levels. Hydrological measurements are not the earliest indicators of drought. When precipitation is reduced or deficient over an extended period of time, the shortage will be reflected in declining surface and sub-surface water levels. Socioeconomic droughts occur when physical water shortage begins to affect people, individually and collectively. Most socioeconomic definitions of drought associate it with supply, demand, and economic good. One could argue that a physical water shortage with no socio-economic impacts is a policy success. Drought is typically measured in terms of water availability in a defined geographical area. It is common to express drought with a numerical index that ranks severity. The Oregon Drought Severity Index is the most commonly used drought measurement in the state because it incorporates both local conditions and mountain snow pack. The Oregon Drought Severity Index categorizes droughts as mild, moderate, severe, and extreme. Although Jackson County is spared from most droughts because of its location east of the ocean and west of the Cascades, it has been affected by droughts in the past. The region experiences dry conditions annually during the summer months from June to September. Periodically, this region experiences more significant drought conditions that affect the region or the state. This spring, many counties in Oregon experienced drought. On March 12, 2014 the Jackson County Board of Commissioners declared a drought emergency for Jackson County based on their findings that Jackson County agricultural and livestock industries, and related economy were suffering widespread and severe economic damage, potential injuries and loss of property resulting from extreme weather conditions within the County. The USDA estimated that for the water year, October 1, 2013, through March 3, 2014, the Rogue Basin was at 31 percent of total average snowpack and only 60 percent of total average precipitation. As of March 2, 2014, storage for the reservoirs was below average and many at just above 50 percent of capacity. Many other Oregon counties made similar declarations. Local, state and federal drought declarations help manage threats to agriculture, recreation, and natural resources. County drought declarations allow for increased flexibility when managing limited supplies and provide jurisdictions with the ability to prioritize a wide variety of water usage needs. County drought declarations usually precede state drought emergency requests that enact emergency provisions for counties. State drought declarations enable counties to benefit from emergency streamlined water rights programs, ground water usage programs and other programs that can help citizens. Counties in a drought D3 (Extreme Drought) or higher at any time during the growing season, can be designated by the USDA as a federal drought disaster area. Counties that are contiguous to federally declared counties are also granted federal drought benefits such as assistance and emergency loans from the Farm Service Agency. The United States Drought Monitor website contains both specific and summary information about drought for the entire United States.